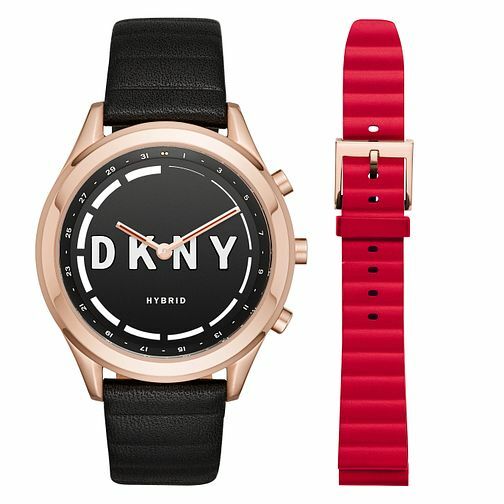 DKNY releases its very first series of hybrid smartwatches that combine a minimalistic design sense with carefully considered functional accents. The date markers on the bezel help you to keep track of the day of the month while the thin indices keep track of individual hours. Receive app notifications through vibrations on the watch that alert you to calls, texts and app notifications to keep your day organised effortlessly. The watch is powered by a coin cell battery, eliminating the need for any charging. Additional features allow you to control your music and other application features by pressing the respective button on the watch. This gift set comes with an additional strap that allows you to swap it out when required, making it perfect as a gifting option. Capture the unique spirit of Donna Karan New York with the stylish DKNY watch and jewellery range.